A good online-business plan must try to forecast the future — and present options in case that forecast doesn’t come to pass. A smart strategy must try to take full advantage of existing web-based applications — with the full knowledge that those technologies may be all-but-obsolete within a few years. You should feature a discussion of your business model prominently in the company strategy section of your business plan. Coming up with a business model is one thing. Coming up with a model that actually works can be quite another. What value do you offer to site users or site advertisers, and how can you convert that value into cold, hard cash (or at least plastic)? Where will your sales revenue come from? That’s your business model in a nutshell. 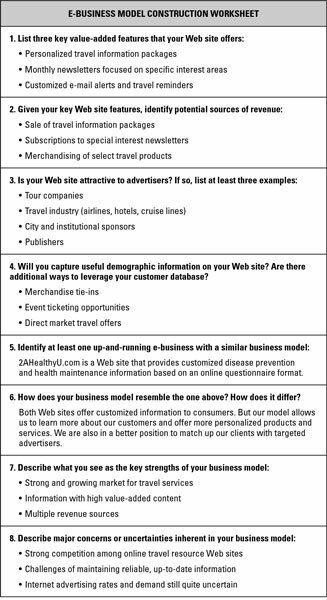 As you think through your answer, use a worksheet like the E-business Model Construction Worksheet shown in the figure. Answer the questions as part of a brainstorming exercise that helps uncover sources of site revenue. Look at the example to see how Cultural Escapes, an online travel information website, built its business model. Even the skeptics have been surprised by how much human activity now takes place on the Internet, from shopping to dating. Still, many Internet-based businesses still need bricks-and-mortar operating centers. Even Amazon.com relies on operations grounded in tradition — stocking warehouses, for example, or filling orders and seeing to it that the goods get delivered to customers by truck or plane. What’s more, Amazon offers in-store pickup options so that online shoppers can go to participating outlets to pick up books, DVDs, CDs, office products, electronics, or other items ordered on the Amazon site. Most online businesses consider web presence as a business strategy that integrates with traditional operations. They move business functions online when and if that’s the most efficient and effective way to build relationships with suppliers, distributors, customers, and employees. The truth is, the line between traditional business and online business has blurred. Most businesses these days are a little of both. Very few companies — even hole-in-the-wall restaurants or dusty antique shops — can make it without some Internet presence.